Patsy Santo pursued a number of professional activities after emigrating to this country from Italy in 1913. He worked for the railroad and as a housepainter. His first artistic effort was an outgrowth of one of his housepainting jobs; his second was undertaken at the request of a friend. 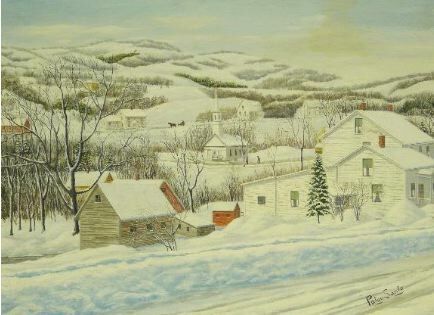 He did not follow up on these sporadic endeavors until many years later, however, when one of his paintings took first prize at the 1937 state fair in Rutland, Vermont. This brought Santo his first patron and inspired him to start painting in earnest. Other exhibitions followed. His introduction to the New York art world was about as auspicious as any folk painter could hope for. He debuted, with Grandma Moses, Morris Hirshfield and a number of others, in a 1939 members-only showing at the Museum of Modern Art. His first one-man show at the Marie Harriman Gallery the following year was a virtual sell-out. His paintings were acquired by the Whitney Museum and the Museum of Modern Art. Sidney Janis included him in his book, They Taught Themselves, observing that Santo, unlike most self-taught painters, evidenced continuing stylistic development. Quite clearly, Santo aspired to academic verisimilitude, and with practice he came close to achieving it. It is easy to understand why his bucolic snow scenes were met with instant success, though some of them can hardly be called true folk art.